Our journey together toward fitness and good health. Well, I’m not dead – but I didn’t do any cardio, either. I had come home from work, taken my clothes off and was standing in my bedroom putting on my pajama pants and t-shirt (typical after work/school attire, fyi – all about comfort over here – I keep a bra on if I’m feeling fancy) before it dawned on me that I’d made a commitment to go to the gym. There was absolutely no way in hell I was going to stop the pajama pants and get back in my car and go to the gym … so I didn’t. I had a decent day – I am just SO far out of the cardio loop that I’m having trouble finding my way back. I love it. ONCE I’VE DONE IT. Getting there? Bit of a problem. All of my meals are happening (or at least being prepared) in the dark lately, so I’m going to have to figure out how to take better pictures. The dark pictures drive me crazy … haven’t taken the time to learn anything, though. 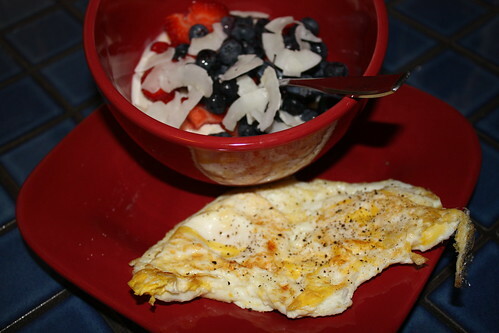 Breakfast was yogurt/fruit with some unsweetened coconut flakes on top and a 2 fried eggs. 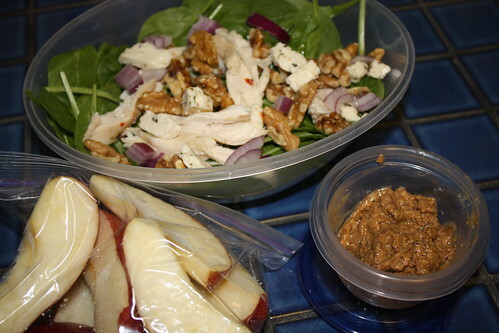 Lunch was a salad that consisted of spinach, walnuts, red onion, feta cheese, some chicken and about a T of oil drizzled on top. I have weaned myself from dressings to the point that a T of plain oil is almost too much. 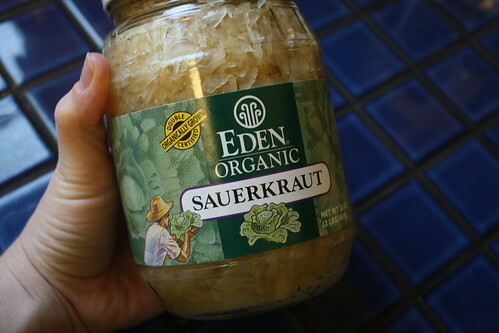 I hardly believe I used to drown salads with ranch or blue cheese dressings – can’t even imagine that now. I cut up an apple and added some almond butter, too. Had a snack when I got home. 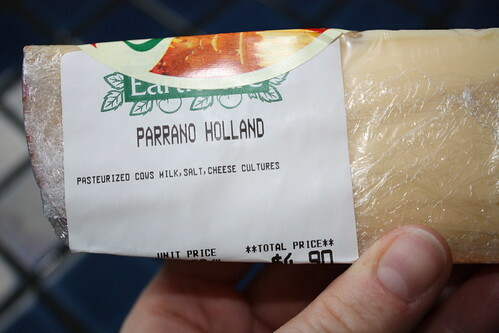 Less than an ounce of some cheese that was on sale at the grocery store yesterday – and out as a sample. We are suckers. I made dinner tonight since Jon slept in this morning and went to crossfit after work vs. before work. 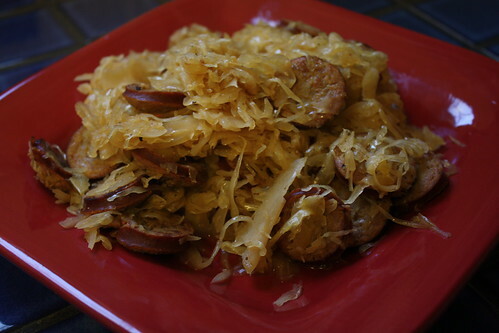 Smoked sausage and sauerkraut. Really can’t get much easier than that. It’s a shame it’s so ugly. 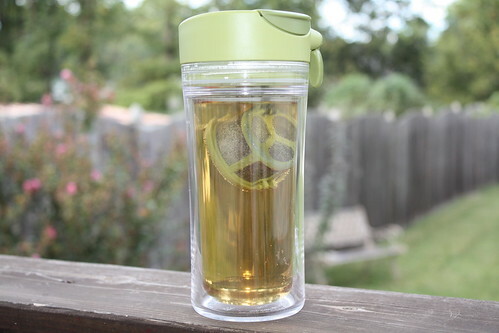 I’m a sucker for cute food/drink things, too … saw this tea thing and had to buy it, of course. Tried it out last night and again today – LOVE it. I drink tea almost daily during the winter (in addition to my daily coffee) and am a little bit of a freak about it. I like it plain and strong – just like coffee. No sugar, nothing added. I counted last night – 7 boxes of different versions of green tea waiting on me in the cabinet … plus some ginger tea and some generic “breakfast” teas, etc. 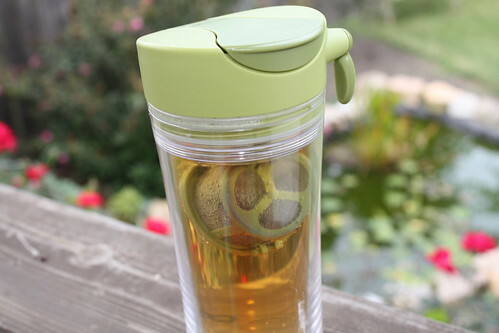 I rarely drink it during the summer – but I’ve been known to believe that green tea is just as miraculous as pepto-bismol. Anyway. This cup is microwaveable (up to 3 minutes says the package), has a lid and has a little drop down thing that holds the loose (or bagged) tea. This is PERFECT for me – a person who spills just about everything I touch and burns myself each and every day. The little drop down thing flips up and hides under the lid. I swear this is the best sippy cup for adults I’ve ever seen. I’m liking it so far. Tomorrow? Trainer, school, pilates. Should be a good day. 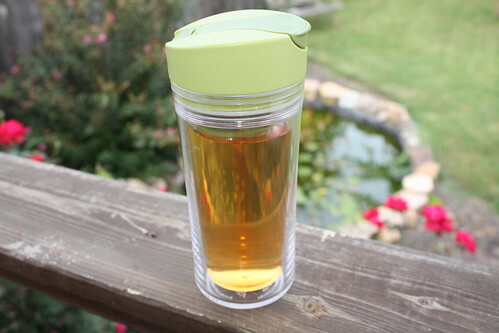 Where did you get the tea traveling mug? I NEED IT! Target! On an aisle with travel coffee mugs … near the dishes.